Sometimes a place defies your expectations and enriches you with the experience of seeing it. 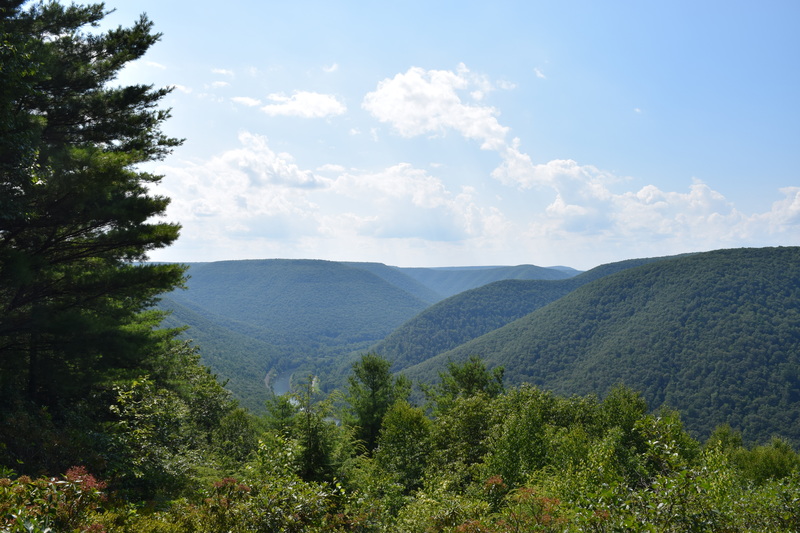 After hiking Clendenin Branch, we set off across the Sproul State Forest along scenic PA 120. We traveled the bottom of canyons as forested plateaus rose steeply in the summer heat. Our first destination were the views off of Jerry Ridge Road. We took in the impressive scenery. Deep, endless green clothed the mountains with its tiers of ridges the defined glens, canyons, and gorges. Two in our group headed back to their campsite at Hyner Run State Park. We, however, had another destination in mind- the old growth forest of Lower Jerry Run Natural Area. This natural area covers 892 acres and is very isolated. It protects several old growth forests (Google Earth appears to show four or five old growth forests) with hemlocks that are almost 120 feet tall. We didn’t know what to expect, and my expectations were fairly low. We found the small trailhead and followed the yellow blazed trail along a forest road with open hardwoods and ferns. The trail turned right and followed a powerline swath; this caused some confusion. The trail followed the swath itself until the second tower, where it returned to the woods, turning left. 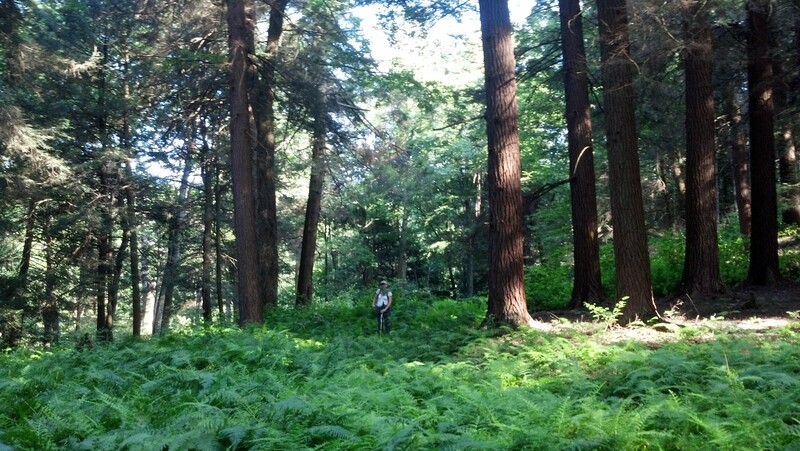 The trail followed an old grade under more hardwoods and ferns. I began to think this was going to be a dull hike. The grade began to descend along the slope of a gorge and became covered with ferns, a faint pathway and yellow blazes were our only guide. We passed some large hemlocks, including one with a crack down the middle. My spirits lifted since I could see some large trees further down into the gorge. We waded through the thick ferns as the sun began to set. 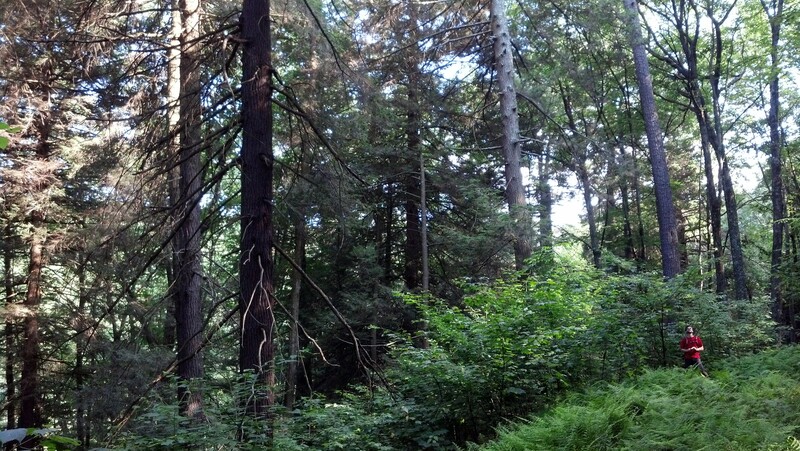 The forest became more beautiful with towering hemlock, pine, maple, and oak. The hemlocks were battling the adelgid, but the giant trees were still alive. The grade turned left and entered the heart of the old growth. We were surrounded by giant, towering trees as shafts of sunlight angled to the forest floor. We were all impressed. What made this place so special was how isolated it was- it felt wild and untamed. There were no noises or sounds. It was as if we were transported back in time when forests such as these covered the state, and were just as silent. We were seeing a place as it has always been. That is so rare. The trail ended in the old growth forest and I knew Lower Jerry Run had more secrets, however, our time was in short supply. We retraced our steps, leaving this hidden realm and returned to a world of roads, cars, and noises. This is a place I will not soon forget. Brochure and map of the natural area. Beautiful. The height of the trees can be somewhat comprehended by comparing them to the smallness of the people shown on the photos, and that gives us the perspective needed to realize how impressive the trees are. Makes one want to visit there, and makes us wonder why we don’t set aside more of our time to go visit these wonders. Again, thanks for sharing, Jeff. I was fortunate enough to be one of the the two people that joined Jeff on this delightfully scenic, bonus adventure following our isolated stroll along Clendenin Branch. The descent down the fern covered grade into the old growth forest was beautiful, and the silence and stillness made it all the more memorable.